I went to our Pediatric ICU in search of M.Z. from Gaza. I heard that his baby daughter was flown here from Southern Israel by helicopter after our medical team connected her to the ECMO machine that temporarily takes over the functioning of the heart and lungs. Our mobile ECMO team is the only of its kind in Israel. I saw a large group of Arabs relaxing on the grass outside the department and asked if M.Z. was among them. They answered me that they were Israeli Bedouins and not from Gaza. I found M.Z. sitting alone outside on the other side of the building ... smoking and looking dazed. Thus our conversation began. After introducing myself and shaking his hand, I asked about his daughter. ‘‘She's only one year and eight months old ... and the only one of my eight children who looks like me.’‘ His eyes were red, tired and reflected great pain. M.Z. told me how the little girl one day could not breathe and how he rushed her, without incident, from Gaza to Soroka Hospital in Beer Sheva. After several days there her condition rapidly and seriously deteriorated and that's when our team flew to hopefully rescue her. M.Z. was angry at the fateful turn of events that had befallen his daughter and could only refer to Allah (God) for mercy. He was grateful that our people were doing everything possible to save his child. We began discussing politics and the direction our two peoples were heading. There we were ... a Jewish grandfather (me) and a Muslim father of a gravely ill child from Gaza ... talking like old friends ... almost like family. The mere fact that he was here while our physicians fought to save the life of his little girl is noteworthy these days. Did we solve anything? Politically, certainly not ... medically, we are hoping for the best. Just another example of life in Israel at eye level ... far beyond the media. We ate and drank together, sitting on opposite sides of my desk and once again spoke as if we had known each other for years. So natural, so right. I then accompanied him back to the ICU where he could be near his daughter. When I left him, we both glanced skywards and opened our hands, acknowledging that Hadil’s fate rested with Allah, God or whatever name we mortals choose to give our Creator. The next morning Dr. Merzel informed me that Hadil’s condition was extremely grave and that she was not responding. The end was near. With a heavy heart, I walked over to find M.Z. He was not there so I looked into the room to see his daughter, jaundiced, so very small and vulnerable, attached to the ECMO that pumped blood and oxygen through her failing body. A moment later, M.Z. entered the hallway with his wife who had been rushed here from Gaza, accompanied by his cousin. She could not bring herself to turn the corner to look upon her daughter … to say goodbye. I respectfully stood well off to the side, as did the nurses, as M.Z. encouraged her forward. Tragedy is any parent having to experience such a moment in their lives. Later, in the hallway, M.Z. introduced me to his wife and cousin. I held her hand between my own and we looked into one another’s eyes. Nothing needed to be said. What a macabre situation I was faced with … not really knowing how to attain the permission they needed. I immediately contacted the head of our security who then put me in touch with a uniformed policeman, Reuven, who was stationed permanently at the hospital. Reuven is an Ethiopian who speaks Hebrew and Arabic as well as his native tongue. ‘‘How do you know Arabic?’‘ I asked him. ‘‘I spent some time in Sudan,’‘ he answered in his typically gentle Ethiopian manner. So began a myriad of telephone calls to first the central police authority and then to the army who was ultimately responsible for any Palestinian entering Israel from either Gaza or the West Bank. The hours were ticking by. If we did not succeed in getting to the right person, then the cousin and wife, when attempting to cross back into Gaza, would be arrested and interrogated as to their whereabouts beyond the time that was allotted them. Such a scenario was incomprehensible to me considering the nightmare they were living. We had run smack into the steel reinforced concrete wall of military bureaucracy. It was then late in the afternoon and I realized that I was in deep water far over my head. I suggested to the cousin that he take a taxi back to Gaza to avoid his being unjustifiably arrested and that we would find a solution for the mother of little Hadil. They all agreed. M.Z. later remembered the name of the Palestinian liaison officer at the governmental level in Gaza who helped negotiate matters of extenuating circumstances … but he did not have his phone number. He tried calling a relative in Gaza who might have that number, but his mobile phone could not make the necessary connection. I took him to our administration office where the only international phone line was located. We were successful in finding his relative and in getting that final phone number. I spoke with the liaison officer who was familiar with the story and he thanked me for intervening on behalf of the family. He also said that he would personally handle the contacts with his Israeli counterpart to guarantee the safe passage of the family when they returned to Gaza. I handed the phone to M.Z. who spoke and shed tears as he thanked the man for his help. I returned home later that evening, several hours after being stopped by those people who needed some help. Palestinians from Gaza. The next day at 9:40 AM, Hadil passed away. With a heavy heart, I walked over to face the bereaved parents. The three of us sat quietly together in their room … as the mother, dazed and broken, mumbled repeatedly … ‘‘Hum-Dulelah, Hum-Dulelah.’‘ M.Z. cried as we parted with a long hug and kisses on both cheeks. We stared long, hard into each other’s eyes and just nodded. Our hospital arranged for an ambulance from Gaza to come and take M.Z., his wife and the body of Hadil back home. Many people complain that an Israeli would never be given an equal opportunity if the situation were reversed. That is not what this is all about. This sad story graphically illustrates a reality of life here that is hidden from the world’s media. Israeli technology, medical expertise and human kindness are available to Palestinians in need. We were not able to save little Hadil, but we tried. My name is Abdol and I’m a Muslim, Zionist Arab. Israel is my home. Israel is where my friends – Arabs & Jews – live. Israel is where I have rights and Israel is where my family lives. I joined the IDF to give back to a country that keeps giving to me. I had a tough time in the army because in my village it was difficult for others to understand why I joined the IDF and on the other hand my unit in the IDF didn’t know how to accept an Arab. But I love my country and I overcome any difficulties. I also learned to understand the Jewish nation. I went to Poland as a student in high school and learned about the Holocaust. One of my main projects was a movie I made about the Holocaust. Its purpose was to ensure this never happens again anywhere in the world. We must not go the way of terror. We must find a way to peace and pluralism. I’m proud to be Arab & Israeli. Tourists to the Western Galilee are usually drawn to the twin villages of Jewish Ma’alot and Arab Tarshiha for the beautiful views and an example of peaceful coexistence. But lately, people have been stopping by Ma’alot Tarshiha for the ice cream. In an old Arab house overlooking the Tarshiha shuk (market), the double town's first ice cream parlor opened its doors in July 2012. It didn't take long before Jewish, Christian and Muslim residents from the surrounding area made a pilgrimage to the site. "Our ice cream is made in the Italian style but influenced by the whole Galilee region. We're not just a novelty of being an Arab-Jewish coexistence ice cream store," says Adam Ziv, co-owner of the new parlor. "We make ice cream that people like." Ziv, a Kibbutz Sasa resident, opened the spacious store with Alaa Sawitat, a Tarshiha native and owner of a popular local bistro. They called it Bouza – “ice cream” in Arabic. Though most people would associate a chic ice cream parlor with bustling Tel Aviv, the 27-year-old Ziv says he purposely chose the periphery for his first business venture. "The feeling in Tel Aviv is that life is normal because people get up in the morning and eat ice cream and go hear a concert − so why not do the same things in the periphery? And besides, I like living in the mountains,” he told Haaretz. Ziv learned the secrets of how to make ice cream and gelato during his travels around the Canary Islands, Italy, Cape Verde Islands and the United Kingdom. He helped fund his trip by working along the way at a small gelato parlor in Pisa, an ice cream store in the Canaries and a family gelato business in Tuscany. He returned to Kibbutz Sasa in the spring of 2011 and announced that he wanted to open a place of his own. He turned to Tarshiha native Sawitat for ideas of where to set up a store. Quickly, the two became business partners and opened Bouza together. While Ziv likes to explore new flavors, the bestsellers at Bouza are the nut varieties. "Anything with nuts – hazelnuts, pine nuts, pistachio – these are our big sellers," says Ziv, who is in charge of making the cold dessert. "We’re trying some Middle Eastern mixes like pomegranate and lemongrass or chocolate and spearmint. We're still working on a kanafeh [sweet Middle Eastern cheese pastry] flavored ice cream but haven't found the right recipe yet. I don't want to be too snooty about the flavors. Our motto is 'simply ice cream' – and that's what we do. We make great ice cream for our general clientele." 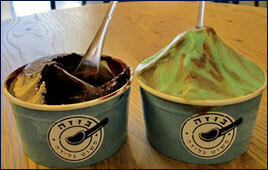 In Israel, where the weather is great nearly all year round, eating ice cream is a 365-day pastime. The average Israeli eats about 10 liters of ice cream per year, compared to 6.2 liters per capita in Italy, home of gelato. Upmarket ice cream parlors can be found all over the country. So, with the Christian-Muslim town of Tarshiha now being dubbed an up-and-coming destination, Bouza's location seems a prime fit. Ziv says Israelis also like the idea of Jewish and Muslim co-owners. "Israelis like to tell a story about a place where they ate. Just like they talk about the best hummus joint or the best place to eat kanafeh, that's how they talk about Bouza. They say, 'We found this place in Tarshiha market.' It's all part of an outing to the Galilee region," says Ziv. Clientele at Bouza is a mix of tourists and people from neighboring villages, cities and ibbutzim. In the afternoons, the place is packed with schoolchildren as Bouza sells its creamy treats for just NIS 5 ($1.25) for anyone in school uniform. The ice cream is sold by portion size and not by scoop -- NIS 9, NIS 13 and NIS 17. Asked what he hopes his customers will think about after eating his ice cream, Ziv says: "I want them to remember the way back." 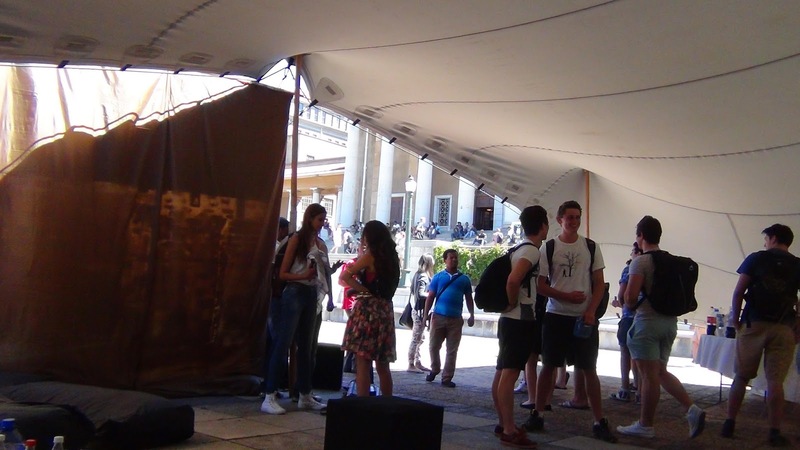 This year in Cape Town, opponents of BDS (boycott, divestment and sanctions) decided to show another side to the coin. 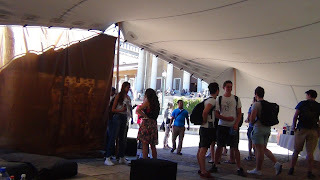 Although totally outmatched by the well-financed and professionally organized BDS movement, these Capetonians adopted a proactive, imaginative approach with an “Israel Peace Week.” (IPW). This can be role model for the many campuses around the world facing IAW activities. 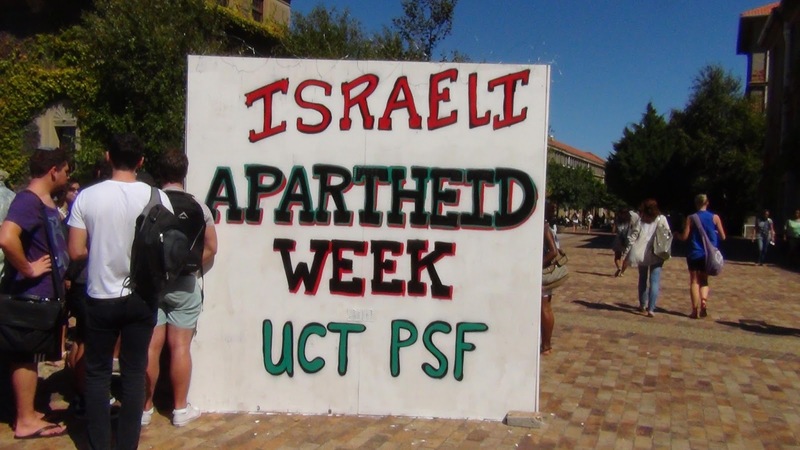 The South African leg of the 9th international Israeli Apartheid Week (IAW) campaign (11-17 March 2013) has officially kicked off! 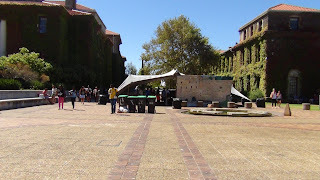 The complete IAW programme (with over 95 events taking place nationwide) was announced at a joint press conference held on Sunday at the symbolic "Apartheid Museum" in Johannesburg. Zingiswa Losi, 2nd Deputy President of COSATU, said at the launch of the IAW 2013 campaign: "Our own experience under apartheid and how it enforced its rule through measures such as the pass laws, banishment, passport denials is currently being replicated by the Apartheid State of Israel on the Palestinian people at an amplified rate…we call for the intensification of the [Palestinian solidarity] struggle, particularly the Boycott, Divestment and Sanctions (BDS) campaign...As our own anti-apartheid struggle has demonstrated, this is an effective, non-violent form of resistance that can bring an end to injustice and contribute immensely to liberation." 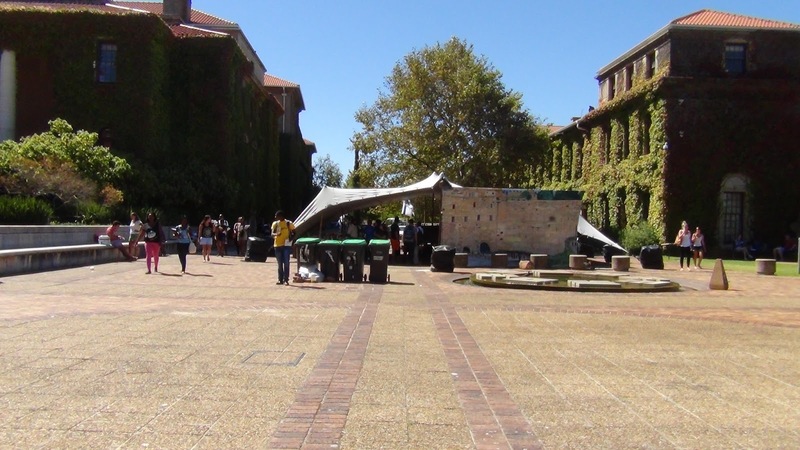 In order to counter these activities, a pro Israel group erected enormous “Abraham’s Tent” on the main plaza of the University of Cape Town campus. There, visitors enjoy the patriarch’s hospitality – falafel, pita, Israeli salad, coffee and juices. 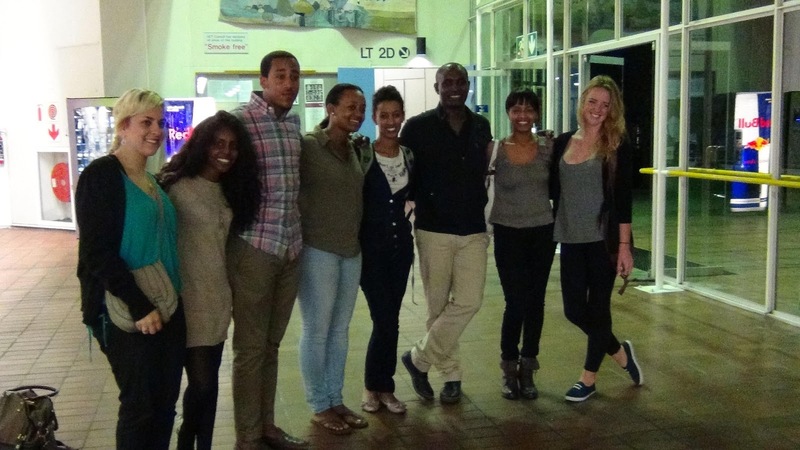 To support the Capetonians a new voluntary organization in Israel known as TRUTH BE TOLD (TBT) in cooperation with the IDC Herzliya and the SA Zionist Federation in SA organized to send five Ethiopian students to South Africa to appear on campuses and among non Jewish and Jewish groups. It was really heartwarming to meet these students at a briefing with TBT before they left. They are charming, sincere and intelligent. They are proud of their African Jewish heritage and proud to be Israelis. All have either served in the IDF or completed meaningful national service. Apartheid analogy and present a very different Israel to the one depicted in South Africa. As an Israeli and as a member of the Jewish/Zionist community I was so proud of them. They spent 2 days with our Jewish youth in our Jewish day schools interacting with the kids and enabling them to see beyond what they read or hear in the media. They have gone onto campus interacted with the students, addressed church service and spoke to 'man in the street', the bouncer at the club etc etc and dispelled many preconceived ideas about Jews and Israel"
The new trending topic on the anti-Israel network is “Apartheid Buses.” According the narrative, Israel has now launched Arab-only bus lines as a new means of oppressing the local Arab population. In fact, however, the truth behind this story is a special service that this Israeli bus company has begun to provide for Palestinian Arab workers from the security checkpoint they pass though to the work areas they want to reach in central Israel. To draw this in a negative light, propagandists have spiced up the story by reporting that the new service was launched after Jewish Israelis complained about the workers traveling on their regular buses. As usual, the propagandists do not allow small details - like the facts - to get in the way of the twisted picture they wish to project about Israel. Tens of thousands of non-Israeli Palestinian Arabs are permitted to work in Israel every day. Those who receive these work permits consider themselves lucky, because the economy in the Palestinian Authority areas is so bad that work places there are hard to find and pay very poorly. Those holding work permits are allowed to enter only at designated security crossings. This is a rule determined by the government security agencies, and has nothing to do with the preferences of the Jewish commuters. After this blitz grew wings and became the center of media attention, Israel journalist Chaim Levenson of Haaretz wrote on his Facebook page that he was going to meet with the Arab workers on the new bus line at 4:30 AM leaving the Eyal crossing. Many workers are headed for early starts at building jobs, where they need to be on site by 6 or so. Obviously, these buses have been provided as a special service, at the time and place that suit the needs of the worker population from that area. Does someone suggest that they wait for the first bus leaving Ariel at 5:30am, and be late for work? Arab-only bus lines owned by Arabs and travelling throughout Judea, Samaria and Jerusalem are nothing new. There are Arab-owned lines running between Shechem (Nablus), Ramallah, Jerusalem, Bethlehem and Hevron. You will never see them stop for a Jew waiting at a bus stop on the way. There is an Arab-only bus station in the American Colony in Jerusalem. Don't expect to see Jewish people walking around there or getting on that bus. Why, you might ask? It’s because the Jews feel threatened there, and, correctly, fear for their safety. On the other hand, Israeli-owned public transportation in all of these places is used by Jews and non-Jews alike. The same bus company, Afikim, which is being accused of running special bus lines - actually tailored to the needs of Palestinian Arab workers - as also launched special bus lines that suit the needs of the students at the university in Ariel. 80% of the university's 14,000 students are commuting from Israel's more central areas, and need more buses coming in during the morning hours, and more leaving at the end of the day. The university’s Arab students enjoy those buses just as Jewish students do. The rumor that Jewish residents were involved in the new bus arrangement was thrown in by some propagandist to make the story more sensational. It is an obnoxious distortion of the facts. The Jewish commuters have nothing to do with security regulations. In fact, the new buses are set to save the Palestinian Arab commuters a lot of money, as their previous alternative was to pay for expensive private taxis to their workplace destinations. There is almost no Arab community that has lived in its homeland for dozens of years in a truly democratic state. The topic of the Arab sector in Israel is politically charged and represents contradicting narratives – one Jewish, the other Arab. Just as there are differences of opinion within the Jewish sector, there are variances in the Arab sector, and attitudes toward the Jewish sector, the state and its institutions can often even represent polar opposites. To start with, there is no such thing in Israel as one “Arab sector”; rather, there are several Middle Eastern populations, some of which are not Arab, and they differ from one another in religion, culture, ethnic origin and histori- cal background. WITHIN THE Arab sector here, there are a number of ethnic groups that differ from each other in language, history and culture: Arabs, Africans, Armenians, Circassians and Bosnians. These groups usually do not mingle, and live in separate villages or in separate neighborhoods where a particular family predominates. a) the Circassians in Israel are the descendants of people who came from the Caucasus to serve as officers in the Ottoman army. Despite their being Muslim, the young people do not usually marry Arabs. c) The Bosnians live in family groups in Arab villages. d) The Armenians came mainly to escape the persecution that they suffered in Turkey in the days of World War I, which culminated in the Armenian genocide of 1915. IN GENERAL, the Arab sector is divided culturally into three main groups: urban, rural, Beduin. Each group has its own cultural characteristics: lifestyle, status of a given clan, education, occupation, level of income, number of children, and matters connected to women – for example, polygamy, age of marriage, matchmaking or dating customs, and dress. The residents of cities – and to a great extent also the villagers – see the Beduin as primitive, while the Beduin see themselves as the only genuine Arabs; in their opinion, the villagers and city folk have lost their Arab character. The Arabic language expresses this matter well: The meaning of the word “ Arabi ” is “Beduin,” and some of the Beduin tribes are called “Arab” – for example, Arab al- Heib and Arab al-Shibli in the North. The Beduin of the Negev classify themselves according to the color of their skin, into hamar (red) and sud (black). Beduin would never marry their daughters to a man darker than she is, because they do not want their grand- children to be dark-skinned. Racist? Perhaps. Another division that exists in the Negev is between tribes that have a Beduin origin, and tribes whose livelihood is agriculture (fellahin), who have low status. A large tribe has a higher standing than a small tribe. - Druse, the religion of the Druse is different from Islam, and Muslims consider the Druse heretics. Because of this, the Druse are supposed to keep their religion secret. - Alawites. the Alawites in Israel live in the village of Ghajar, in the foothills of Mount Hermon, and some live over the border in Lebanon. They are also considered heretics in Islam, and their religion is a blend (syncretism) of Shi’ite Islam, Eastern Christianity and ancient religions that existed in the Middle East thousands of years ago. The meaning of the word “Ghajar” in Arabic is “Gypsy,” meaning foreign nomads with a different religion. According to Islam, they not have the right to rule, being a minority, but also right to live, being idol worshipers. SOME PARTS of the Arab sector are communities that have lived in the land now called the State of Israel for hundreds of years, but a significant part is the offspring of immigrants who migrated here mainly in the first half of the 20th century to work in the Jewish farming communities. Many migrated from Egypt even earlier, to escape being impressed into forced labor as the Suez Canal was being dug. This is how the al-Masri, Masarwa and Fiumi families, as well as many others, came here, with names testifying to their Egyptian source. Other families have Jordanian names (Zarkawi and Karaki, for example), Syrian ones (al-Hourani, Halabi), Lebanese (Surani, Sidawi, Tra- bulsi) and Iraqi (al-Iraqi). The Arabic dialect that most of the Beduin in the Negev speak is a Saudi-Jordanian dialect, and because of their familial ties to tribes living in Jordan, when the Beduin become involved in matters of blood-vengeance, they escape to family members in Jordan. The connection between Arab families in Israel and groups in neighboring countries should not be surprising, because until 1948 the borders of Israel were not hermeti- cally sealed, and many Arabs of “Sham” (Greater Syria) wandered almost totally unimpeded, following their flocks and the expanding employment opportunities. THE DIVISION between traditional and modern outlooks exists in each group, meaning that in each group there is a subdivision: those who are more connected to the tradition of the group and those who are less connected. Among the young, one sees more openness and less adherence to group tradition, and it can be assumed that the youth of the next generation will generally adhere even less to the group’s traditions. This is obvious among the Beduin groups, because among the young there are more than a few who challenge the Beduin’s socially accepted ways. Education also plays an important role in the changing attitude toward tradition, because Arab academics are usually less linked to social tradition and the framework of the clan, and live more within the framework of nuclear families (father, mother and children). They also tend to move to more open areas, such as mixed cities like Acre, Ramle and Lod, and even to Jewish cities such as Beersheba, Karmiel and Upper Nazareth, where they adopt a modern lifestyle. The shift to the city is also connected to a change in the source of livelihood. There are more in the independent professions and fewer in agriculture – a change due partly to the confiscation of the lands of absentees after the War of Independence. BEYOND THE religious dividing line that differentiates Jews and non-Jews, another basic division exists between the country’s Jewish and Arab sectors in their general approach to the state. For most of the groups within the Jewish sector, the State of Israel fulfills two roles. One is the political and governmental embodiment of the Jews’ aspirations to return to themselves and to regain the independence and sovereignty over the land of their fathers that was stolen from them after the Second Temple’s destruction. The symbols of the state are Jewish: the national anthem, which includes the words “the Jewish soul yearns”; the flag, which represents the prayer shawl; the Star of David; and the seven-branched menorah. Hebrew is the official language of the state, and on Jewish holidays, the governmental institutions are closed. The second role of the state in the eyes of most Jews is functional: to provide its citizens with security, employ- ment, livelihood, health, education, roads, bridges and social services. For the Arab sector, the first role does not exist. The State of Israel is not the embodiment of their diplomatic and political dreams. The national anthem is not their hymn, the symbols of the state are not their symbols, and our Independence Day is their Nakba (disaster). The second role as well, the functional, is only partly fulfilled in matters of education, planning, roads and infrastructure. One may argue about the causes and reasons, but the facts are clear: How many Arab members are there on government companies’ boards of directors? How may Arab judges are there in the High Court? What is the proportion of Arabs in the academic staff of universities? That said, one cannot ignore the phenomenon of reverse discrimination, either. Laws of planning and building that are observed almost fully within the Jewish sector are very loosely observed within the Arab sector, especially in the Beduin sector in the Negev. How many thousands of buildings have gone up in the Negev without building permits, on land that does not belong to Beduin? How is it that there are no sidewalks in Umm el-Fahm, and the distance between the buildings is about the width of the cars? Another example of reverse discrimination exists in the area of marriage. If a Jew dares to marry a woman before he has completed the process of divorce from his present wife, he will find himself behind bars. But if an Arab mar- ries a second, third or fourth wife, the state pays a monthly children’s allowance for each wife separately and without asking too many questions. Another case of discrimination in favor of Arabs exists in the area of housing. About 90 percent of the Jewish sector lives in apartments, and about 10% in private houses. In the Arab sector the picture is the reverse.